It is so amazing to see a new design with Artfil yarn coming up! The Hot Springs Beanie is a must have accessory. It is created by Kristie Statuto, adorable, young and talented lady. A year ago Kristie saw Artfil at Vogue Knitting Live in New York, and she happened to fall in love with our yarns! The Beanie in question is knit with Mericana DK in Teddy Bear colourway. The pattern will be published this week, and Kristie will host a giveaway to celebrate the launch of her newest design. She agreed to answer few questions, and I am happy to share them with you. Q:Hi Kristie, tell us a little bit about you and how you decide to become a knitwear designer. I’m 25 years old living in Queens, NY, and I absolutely love knitting and making. I think there’s much to be said about handmade items, from all that goes into making them, to the journey they take after being finished, and I love every bit of the process. I’m still a fairly new designer, but I ventured into the design world earlier this year when I dreamed up of a hat that I had never seen done before. So I jumped right in and tried to make it happen, and ended up having so much fun with the process. I then fell even more in love once I began seeing knitters work up my designs. It’s such a surreal feeling, and so inspiring to know that I have the chance to hopefully inspire other knitters! I find inspiration for my designs from just about anywhere, but they’re largely inspired by nature. This beanie, for instance, was inspired by a trip to Colorado I took earlier this year. One very cold –15 degree night, I visited a hot springs park in the mountains, and it was such an amazing experience. There was no electricity, so all you could see were the large silhouettes of evergreens and so many stars. It was the most magical thing and I really wanted to translate that magic into this design. Q: What are your favorite yarn compositions to work with? I’m almost always knitting with wool, my favorites being merino and cormo. I just love the warmth wool provides, and the journey it takes from sheep to finished item. I’ve also just started experimenting with linen and cotton for summer knits, and I’m excited to see where that takes me! Q: The beanie we are discussing today is your first design with ARTFIL yarn. What was it like working with it? I had such a great time knitting with ARTFIL for this design! It’s very smooth and easy to work with, and it felt wonderful in my hands. What I particularly like is the incredible stitch definition it creates. Every stitch is so crisp, which really compliments the lace in the pattern, and makes it pop even more. Q:How is ARTFIL yarn different from other yarns you have worked with? Choosing sustainably made yarn is very important to me, and that’s what first caught my eye when I discovered ARTFIL. The process in which you dye the yarn is so unique to any other yarn I’ve used. The colours that result from your unique process are gorgeous and have so much depth to them. The colorway I used for the sample is “Teddy Bear,” and I fell in love with the different layers of browns in it and how they all came together in the final piece. Q: Tell us about the pattern and the level of difficulty. 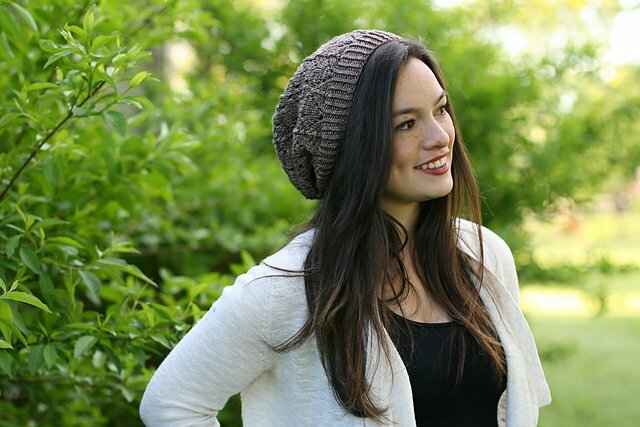 Hot Springs is very light and slouchy beanie that is worked seamlessly, in the round. It has just the right amount of lace, making it a great pattern for a seasoned beginner who is looking to give lace a try. It’s quite versatile, and a great beanie to wear any time of the year! We love it, and we won’t miss it! Posted in Hats, Patterns and tagged mericana DK.